Clement Neff V was born May 10, 1797, in Windham Co., CT, and died April 9, 1881, in Singhampton, Simcoe Co., Ontario, Canada,, at age 83. Buried in Trinity United Church Cemetery, Nottawasaga Twp., Simcoe Co., Ontario, Canada. He is the son of Clement Neff IV of Hampton, Windham Co., CT, and Susannah Abbe of Windham, Windham Co., CT.
Mary Honeywell was born May 13, 1801, in Northumberland Co., Upper Canada, and died May 25, 1887, in Singhampton, Simcoe Co., Ontario, Canada, at age 86. Buried in Trinity United Church Cemetery, Nottawasaga Twp., Simcoe Co., Ontario, Canada. Clement Neff V and Mary Honeywell were married about 1818 in Upper Canada. Calvin Neff: Born 1819 in Orono, Durham Co., Upper Canada; Died March 14, 1867, in Nottawasaga, Ontario, Canada (age 48). Isaiah Neff: Born 1823 in Orono, Durham Co., Upper Canada; Died Unknown. Salmon J. Neff: Born 1826 in Orono, Durham Co., Upper Canada; Died Unknown. Milo Curtis Neff: Born 1828 in Orono, Durham Co., Upper Canada; Died Unknown. Aquila Neff: Born 1830 in Orono, Durham Co., Upper Canada; Died Unknown. Priscilla Neff: Born 1830 in Orono, Durham Co., Upper Canada; Died Unknown. Clement Edmund Neff: Born February 18, 1832, in Haldimand, Northumberland Co., Upper Canada; Died February 14, 1925, in Medicine Hat, Alberta, Canada (age 92). Buried in Trinity United Church Cemetery, Nottawasaga Twp., Simcoe Co., Ontario, Canada. Married to Margaret Beecroft: Born December 4, 1844, in Nottawasaga Twp., Simcoe Co., Canada West; Died March 16, 1929, in Medicine Hat, Alberta, Canada (age 84). Buried in Hillside Cemetery, Medicine Hat, Alberta, Canada. Martha Elizabeth Neff: Born 1833 in Orono, Durham Co., Upper Canada; Died Unknown. Maitland Neff: Born 1852 in Orono, Durham Co., Upper Canada; Died Unknown. 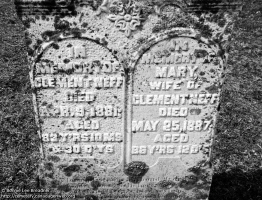 Clement Neff V and Mary (Honeywell) Neff are buried in Trinity United Church Cemetery, Nottawasaga Twp., Simcoe Co., Ontario, Canada. Photo courtesy of Bonnie Lee Breadner & Myrna White. Clement Edmund Neff is buried in Trinity United Church Cemetery, Nottawasaga Twp., Simcoe Co., Ontario, Canada. Photo courtesy of Bonnie Lee Breadner & Myrna White. Margaret (Beecroft) Neff is buried in Hillside Cemetery, Medicine Hat, Alberta, Canada. Clement Edmund Neff: Born February 18, 1832, in Haldimand, Northumberland Co., Upper Canada; Died February 14, 1925, in Medicine Hat, Alberta, Canada (age 92). Buried in Trinity United Church Cemetery, Nottawasaga Twp., Simcoe Co., Ontario, Canada. Clement Neff V was born May 10, 1797, in Windham Co., CT. It is surmised that brothers Isaac Abbey (age 27) and Nathaniel (age 28), along with their sister Dorcas Abbey (age 26) and their nephew Clement Neff (age 1) came to Northumberland Co., Upper Canada, from New York about 1798. They were some of the pioneering settlers of Durham Co., Ontario, Canada. If this connection is accurate, the Abbey ancestry can be connected through their father Isaac Abbe all the way back to John Abbe, born about 1587 in West Halton, Lincolnshire, England. His son, John Abbe, Jr. of Norwich, Norfolk Co., England emigrated to the United States about 1635 and married Mary Loring in 1635 at Wenham, Essex Co., MA. Mary Honeywell was born May 13, 1801, in Northumberland Co., Upper Canada. In 1806, the magistrates in Newcastle District fined Isaac Abbe 30 shillings, a very large sum for that period, for assaulting Clement Neff, "an infant." Similarly, they fined a man who was convicted of assaulting a widow and a male of that same name (her son?) 6 pounds in 1832. 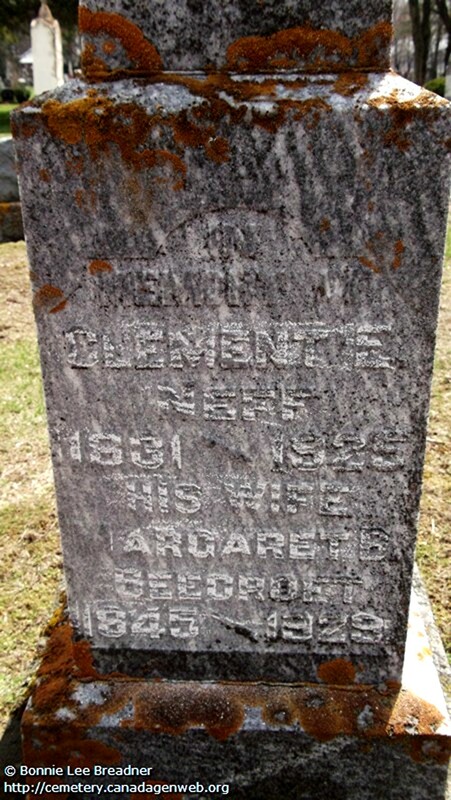 Clement Neff V died April 9, 1881, in Singhampton, Simcoe Co., Ontario, Canada,, at age 83. 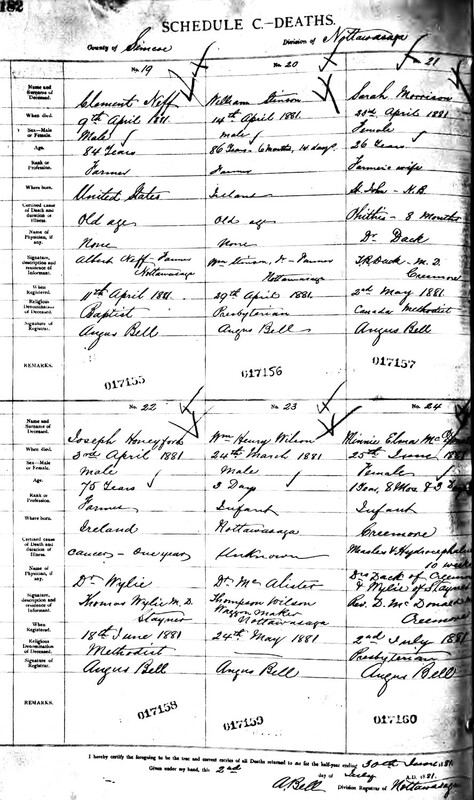 Clement Neff V Death Record. Mary (Honeywell) Neff died May 25, 1887, in Singhampton, Simcoe Co., Ontario, Canada, at age 86. The first wife of Clement Neff III was Susannah Abbe, the daughter of Benjamin Abbe and Prisella Unknown. They had at least three children: Benjamin Neff born about 1762; Clement Neff IV born about 1764; and Nathaniel Neff born about 1766. Clement Neff III was a soldier, but after his wife Susannah died about 1774 he left the farm and went to sea, where he was taken prisoner by pirates and was carried to Algiers where he was a captive for 24 years. It is likely that the three Neff children (Benjamin about age 12, Clement IV age 10, and Nathaniel age 8) then made their home with their uncle Isaac Abbe (born 1753). When Clement Neff III returned from captivity he married (at age 65) Patience Dean (age 28) on November 17, 1800 in Windham, Windham Co., CT.
Susannah Abbe was born November 15, 1760, in Windham, Windham Co., CT.
Clement Neff IV and Susannah Abbe were married about 1788 in Connecticut. Susannah (Abbe) Neff died after 1802 in Unknown. 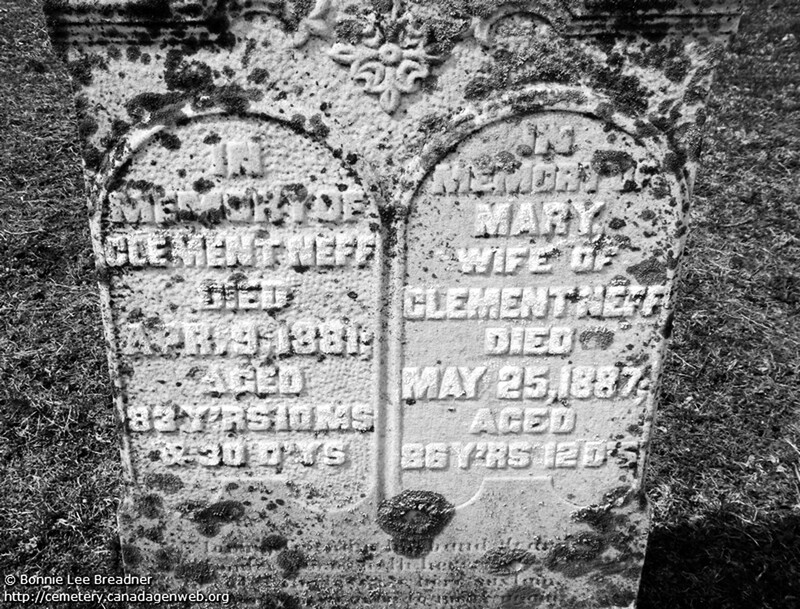 Clement Neff IV died 1808 in Hampton, Windham Co., CT, at about age 44. I have information on all of his descendants, but have hit a big brick wall finding out anything about him. I have learned from the Neff News pages, that Clement Neff is the start of the ONT B1 line of the Neffs here in Ontario, but I would really appreciate ANY info in regards to his parents etc. We have been told that he might have been adopted?